The Royal city of Old Mournhold was destroyed at the end of First Era by the Daedric Prince Mehrunes Dagon. Almalexia and Sotha Sil came too late to prevent this destruction, but they managed to banish Mehrunes Dagon back to Oblivion. 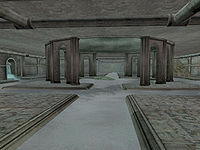 Old Mournhold are now the expansive ruins of that older city on which present-day Mournhold has been built. Old Mournhold can only be accessed through the sewer system and holds many secrets. Many quests take you underground. 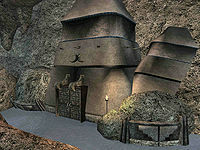 Be careful, Old Mournhold is the base of operations for the Dark Brotherhood, Goblins and other dangerous creatures. Main Sewers — Includes Manor District, Bazaar, Palace, Residential and West Sewers. 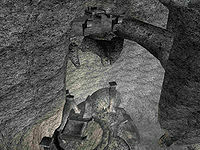 For a description of present-day Mournhold, click here. The Shrine of the Dead: Explore the Temple Sewers to find and cleanse this forgotten shrine. Investigate Bamz-Amschend: Explore a newly-discovered ruin and find out where the fabricants originate. This page was last modified on 13 April 2013, at 04:33.